Locked-Up Garmin FR610 - here's how I fixed it - Run. Bike. Code. I’m a technology geek. I love my gadgets and I like to delve into the numbers those gadgets record while I run or bike. All the more I get frustrated when devices don’t work as I expect them to. I tried to make that black box go away by hitting a couple of buttons, but none worked. Even holding the power-button for a long time (long enough that the unit would normally turn off) didn’t do anything. Kinda frustrated I continued to run. Now, for reasons unrelated to this blog post (and also unrelated to the error), I had a 20 minute alarm set on the watch. And surprisingly, this alarm went off every 20 minutes, which made me realize that the watch wasn’t entirely dead. To cut a frustrating story short, upon arriving home I had the bright idea to hook the watch up to the charger, which at least produced the usually “I’m now charging” beep. Also, hitting the lap button or stop button produced the corresponding beeps again, alas the screen still stayed in its locked black-box mode. As a desperate last resort, I tried to power off the device. Hint: if you hold the power-button long enough the device will power down without your answer on the “Power down? Yes/No” prompt. Surprise, surprise, the watch finally powered down. Upon restarting the watch all went back to normal. The exercise data of the run was mostly gone. More specifically: the summary was there, but wrong in terms of mileage, of course, as the run was cut off at 3km, right when the watch locked up. At least the Garmin wasn’t completely bricked. So, if you came here because you experience(d) something similar, leave a comment and let me know how you were able to solve the lock-up? 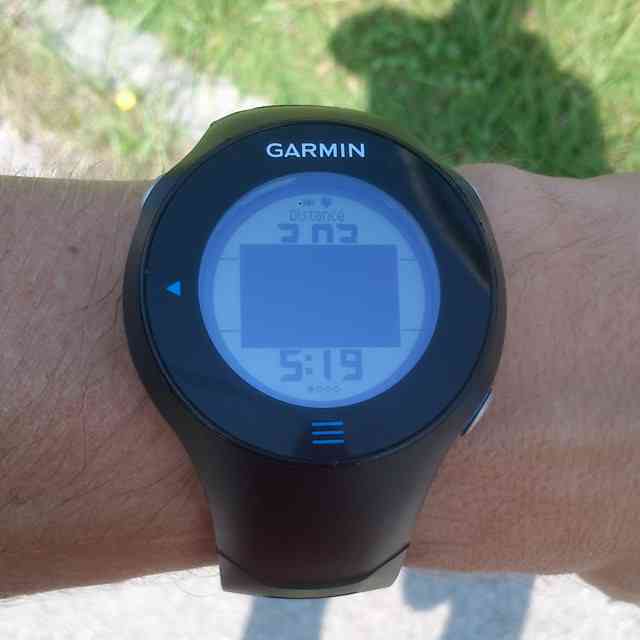 Did charging and rebooting the Garmin help? Update October 14, 2014: Today my Garmin FR610 locked up again, also right after showing a lap-split, with exactly the same symptoms as described above. Again I was able to “revive” the watch by hooking it up to the charger and then rebooting it. In order to prevent future encounters with this bug I decided to do a hard reset (thereby deleting all history, not an easy step to take). I hope this cures this issue for the time being.